Dale tagged me with this and I’ve been really crap and taken ages to take up the baton, as it were. So the rules are that I have to open the book at page 123, skip five sentences then share the next three sentences with you all. With that done, I have to tag three of you to do the same on your blogs. I think I see how this works. 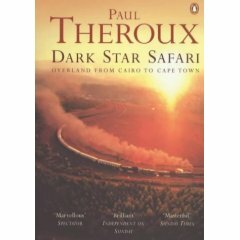 I’m actually reading about four books at the moment (scatterbrain mind, I’m sorry), so the one I’ve picked is Paul Theroux’s Dark Star Safari, which a kind of travelogue across Africa, done in his own inimitable style. So um, the sentences. “Hararis claim not to be frightened of hyenas, and many qat-chewers sat out a night, stuffing their mouths, diverted by the sight of hyenas coming and going and in their foraging similarly chewing. Tony Blair bags a whopping cheque! So Tony Blair is being paid a whopping Â£5m for his memoirs, covering his time in Parliament and the 10 years he spent as Prime Minister. I know this is pretty run-of-the-mill stuff nowadays and many of these weighty tomes are successful. Bill Clinton’s autobiography, My Life, flew off the shelves when it was released in 2004, for example. But it feels different for our esteemed former PM. Not only has his beloved wife recently revealed that she is going to publish her memoirs (probably before hubby), but we’ve already had diaries from the likes of Alistair Campbell and David Blunkett, both of whom were very close to Tony Blair, during his time in No.10, while John Prescott’s thoughts (unsurprisingly ghost-written by Hunter Davies) are coming out in June 2008. Surely, there can’t be much more to read about that time, other than Tony’s night-time thoughts about his wife, or what he really thinks about George Bush. And, given that Blair is staying in the public eye with his new role as Middle East Go-Between, or whatever it is, he’s not going to want to say too much, for fear of looking a little silly at that next ambassador’s drinks reception, is he? And what’s with the Â£5m? Are Random House mad? Do they genuinely think that they will sell enough copies of his book to justify that sort of money? OK, so Bill Clinton got Â£6m, but that’s rare. I mean, Jerry Hall only got Â£1m, and I’d far rather read about her life with Mick Jagger, than I would Tony’s with Cherie and Gordon. wouldn’t you? Author robPosted on October 27, 2007 October 3, 2009 Categories books, celebs, politicsLeave a comment on Tony Blair bags a whopping cheque!